Along the way, tiny towns rise out of the prairie almost as abruptly. Yet somehow the smaller the town, the bigger the sense of community. 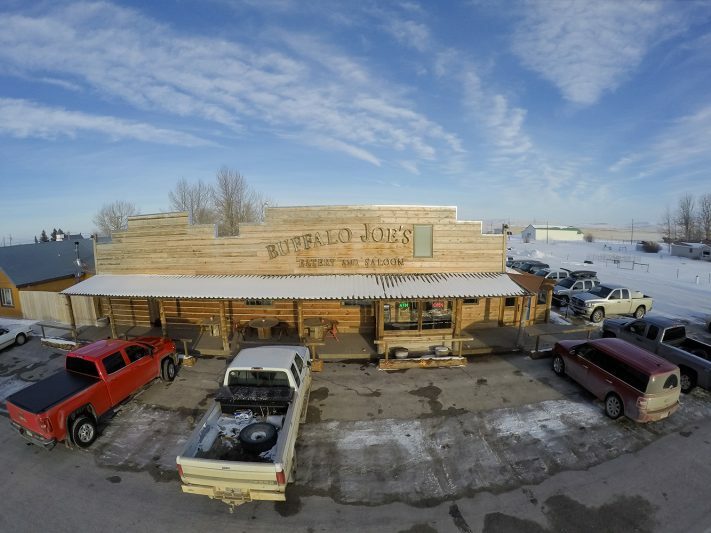 That innate call of community brought Vicki Beck back to her hometown to open up Buffalo Joe’s. “I always had in the back of my mind to do something here,” begins Vicki. Following a fire that burned down the lone restaurant in town, she found her opportunity. “My whole enjoyment out of this is seeing the people have a place to go, to come and have a beer, to have a dinner and be able to visit,” Vicki says. Though she didn’t have any real restaurant experience, she had plenty of history with the space. Her parents bought the original building in 1948, running it as Billips Grocery in the front while her family lived in the back. Like most growing up in a small community she had many duties, from helping with the store to filling in on drums with the family band. At age nine, she forged a friendship with Western author Ivan Doig who lived nearby, exchanging letters for many years. Vicki’s family eventually sold the building and moved, but her roots were set. Some 50 years later she bought the building back, ready to remodel. 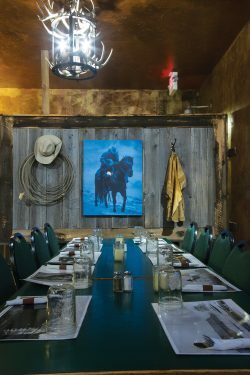 The restaurant feels distinctly Montanan, built of barn wood, leather and tin, but it blends the rustic with a modern sentiment. They cater to the locals, rather than the tourists, supporting the community that supports them. “We thought we would be lucky to sell ten hamburgers a week,” says Vicki’s husband Ted of their opening. Last year, they went through 4,500 pounds of ground beef and 8,500 pounds of prime rib, nearly “four and a quarter ton” as he puts it. “There’s a lot of carnivores around here,” Vicki adds with a smile. 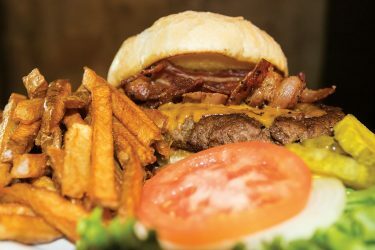 Tall, ten-ounce burgers and hand-cut fries keep people coming back for lunch, but dinner is the main draw. And, nothing packs them in more than the Prime Rib. Perfectly pink with rich, roasted flavor, if the words tender and juicy mean anything to you, this is the hunk of meat your mouth wants. Served as a thick slab, it fills the air with its succulent scent while dripping juices all over your plate. “These guys are farmers and ranchers, and you better offer them a big piece of meat,” says Vicki. “They don’t want tofu. They don’t want bagels with lox,” she jokes. 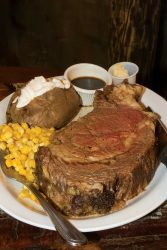 While Prime Rib reigns supreme for many, it’s not the undisputed king of meats. The Black and Blue Sirloin makes for a bolder choice. It’s a leaner cut with bigger beef flavor that begs for the pungent punch of the creamy blue cheese on top. Some say beef only needs salt and pepper. Ignore that nonsense, because blue cheese makes everything better. The Chicken Fried Steak with mashed potatoes is another country classic. The crispy, golden-brown breading on the steak plays well with the light, pillowy mashed potatoes. Like comfort food done right, both come smothered in white peppered gravy. 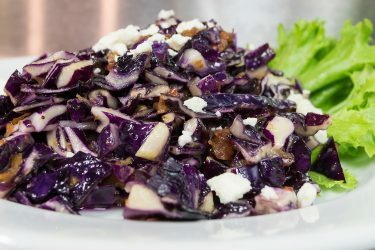 The Hot Slaw is a recipe rumored to have begun in a bar in Highwood before gaining a small-town cult following. Slightly tangy and just a bit sweet, the deep purple cabbage arrives warm but not wilted. Topped with big chunks of feta and smoky bacon bits, it’s an indulgent way to eat your vegetables. The dinner rolls (as well as the eggs and as many vegetables as possible) are fresh from a local Hutterite Colony. Impossibly fluffy, the rolls come hot with just a hint of buttery sweetness baked in. Up and down the menu one thing is clear, this is ranch food for ranch folk. In his autobiography on his time in the area, Ivan Doig wrote: “The spaces between stars are where the work of the universe is done.” If you squint just right on a dark night, the lights from the tiny towns, farms and ranches dotting the prairie form their own sort of celestial roadmap. If you find yourself near Dupuyer, look for the brightest star and follow it North.